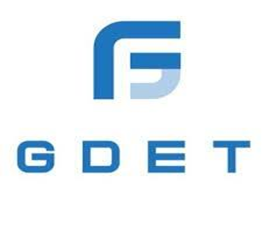 GD ENTERTAINMENT AND TECHNOLOGY, INC.
GD Entertainment & Technology, also known as GDET, focuses on high growth industries to fulfill a diverse selection of premium products nationwide. The company currently has three subsidiaries: DreamCard, HyperDigital Technologies, and The Greenery. DreamCard allows users to create a customizable debit or credit card using its state-of the-art online platform Dreamcard.cc HyperDigital Technologies is the Cryptocurrency ATM sector of GDET and aims to secure multiple MSB, money services business, licenses in order to host ATM units throughout the country. The Greenery is a new subsidiary slated to launch a broad offering of hemp-derived CBD products. GDET may be one of the only publicly-traded pure play covering three of the fastest growing, multi-billion-dollar, next-gen industries: Cryptocurrency, Blockchain, and CBD products. Thus, investors can participate in all 3 industries via one investment vehicle, GDET. GDET’s new CBD products subsidiary, The Greenery, appears poised to generate meaningful revenue right out of the gate. The Company has been prepping for the receipt of inventory for its initial diversified, product run. Given the upcoming aggressive rollout of its target marketing, we believe that the CBD subsidiary alone could end 2019 on a $2-3M annual revenue run-rate. GDET’s HyperDigital Technologies subsidiary is setting the stage to secure multiple money services business licenses in order to host cryptocurrency ATM (or kiosk) units throughout the country during 2019. Once deployed, these units can generate high returns per transaction, regardless of crypto pricing changes. GDET also runs crypto mining operations in New Jersey. An early stage player with a diversified revenue stream in high profile and high growth markets, we believe GDET offers considerable upside. As GDET achieves CBD revenue milestones along with broad cryptocurrency ATM deployment, these event-driven shares could reach the $0.06 level, a valuation similar to other high-growth, diversified emerging companies. New Jersey-based GD Entertainment and Technology Inc. (OTC – GDET - $0.017 – NR) is a diversified emerging company focused on high growth and high-profile industries, including hemp-derived CBD Products, Cryptocurrency, and Blockchain. Although the Company is in the early innings of its business model, we believe that a great deal of business development activity and meaningful revenue generation is set to occur during 2019, driving these shares toward their 52-week high of $0.148. Moreover, as what we believe to be the only publicly traded company focused on the aforementioned multi-billion-dollar markets, GDET serves as what is likely the only publicly traded pure play on CBD, Crypto, and Blockchain. The Company’s newest subsidiary was launched earlier this month and we believe it offers the greatest promise. 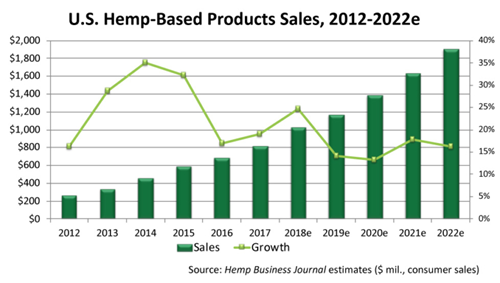 There is substantial interest in hemp-derived CBD-infused products, as evidenced by the recent flurry of M&A, and investment activity in the industry over the past few months. According to a report by the Brightfield Group, the hemp-derived CBD market is forecast to reach $22 billion in 2022. Given that the market remains fragmented, in-demand, niche offerings likely to be sold by GDET position the Company for rapid market share gains. Examples of niche successes abound from Martha Stewart’s touting CBD health benefits for pets through her alliance with Canopy Growth to the maker of new products such as CBD-infused Jelly Belly candy (leading jelly bean confectioner,) where all of the inventory was reportedly sold on the day available. Considering that niche hemp-derived CBD products are able to gain swift and significant traction, we envision a similar pathway for some of GDET’s future offerings. Importantly, niche products such as creams and salves carry very healthy profit margins. Given the upcoming, official product introductions and aggressive rollout of its target marketing, we believe that the CBD subsidiary alone could end 2019 on a $2-3M annual revenue run-rate. The Company’s HyperDigital Technologies subsidiary is in the process of securing/applying for multiple MSB licenses to secure multiple money services business licenses in order to host cryptocurrency ATM (or kiosk) units throughout the country. Once deployed, these units can generate high returns per transaction, regardless of crypto pricing changes. GDET also runs a Bitcoin crypto mining operation in the Tri-State area. The first site of the Company’s ATM is in Texas and it is possible that GDET has kiosks in as many as 8-10 states this year. Separate state licensing is required and thus the timing of application approval, licensure and deployment per state varies. These units enable consumers to purchase cryptocurrencies (Bitcoin) in digital wallet or “hard form” in exchange for cash deposits. HyperDigital generates a commission/fee per transaction. In the future the Company is exploring the option to offer Cryptocurrency POS (point of sale) operation for retailers which will allow brick and motor retailers to accept cryptocurrency as payment directly from their customers. It should be noted that while this sector has become unfavorable in many circles due to the currency values crash and widespread news regarding theft, the Crypto ATM market is booming and many currencies have rebounded over the past 2 months, creating a resurgence in interest in the space. Still, the Company’s low-cost/high return approach in its fast-growing niche should serve it well. Moreover, the industry is in the early innings of growth, is highly fragmented and GDET could emerge as a leader. Dreamcard, a separate e-commerce business line, is essentially a vanity or personalized debit/credit card service that, for a fee, allows users to create a customizable debit or credit card using its state-of the-art online platform. 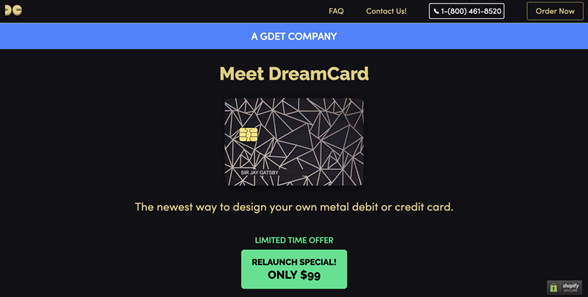 Dreamcard simply takes an existing debit or credit card and transfer its data and EMV chip into a new metal card of the cardholder’s design and ships it to the holder. DreamCard has been awaiting cold-storage prototypes where the user can customize their card to store Cryptocurrencies such as Bitcoin directly onto the product. This offers users a more tangible/hands-on approach in a market that is for the most part totally virtual. While an interesting offering, we do not believe it carries the upside potential of the subsidiaries listed above. Interestingly, these three segments have one common thread: Millennials. Millennials have significant interest in these three offerings and we believe that GDET may find ways to cross-sell or find the ties that bind them together. In essence, by virtue of targeting (not exclusively) markets in which millennials are active, GDET is also a play on the millennial market—a valuable demographic. In the future, the Company intends to expand its operations into different sectors related to the blockchain including dynamic cryptocurrency mining applications, blockchain applications, solidity smart contract development, cryptocurrency hashpower leasing, sales, service and B2B cryptocurrency consultation. As the Company’s HyperDigital subsidiary continues to forge ahead, we project that new blockchain applications leveraging cryptocurrency could be launched, sometime in 2019. Blockchain technology is a decentralized network of computers in which data is cryptographically encrypted and stored in a block. Each block represents a transactional record that has a chain that links them. The distributed computer network confirms the record and lists the blocks of transactions sequentially. Blockchain allows for protection against malicious attempts to alter data. Bitcoin transactions are secured by blockchains and as a reward for doing the work to track and secure transactions, miners earn bitcoins for each block they successfully process. To date, GDET has generated little revenue in its current initiatives. However, going forward, we believe that the Company will begin to generate meaningful revenue from its Crypto ATM line in the second half of 2019 and could begin to record positive ROI as well. Plus, with a likely April 2019 launch of its initial CBD offerings, with more SKUs to follow, we believe that through sales via its e-commerce site, Amazon, and third-party opportunities online and in bricks and mortar, GDET may end the year on a $2-3M annual revenue run-rate in this segment alone. As a result, 2019 could be viewed as a building year for the Company with substantial revenue growth to begin in 4Q19 and in 2020. Interestingly, both marijuana and hemp contain a cannabinoid known as Cannabidiol, CBD, which makes up 40% of the plant’s extract. As confirmed by major organizations such as the NIH and WHO, CBDs have demonstrated to be useful to treat major diseases and serious conditions while simultaneously been found to be safe for use by consumers. The National Institutes of Health (NIH) is a huge supporter of CBD research, with 281 projects funded to the tune of $111M in 2015 alone, and a new one slated to begin the funding phase at year-end 2017. Against this backdrop, the proliferation of CBD-based products has ballooned of late and huge growth is expected in the coming years. The Brightfield Group, in a report issued in late 2018 projected that Hemp-based CBD products will reach $22 billion in 2022. Obviously, the recent legalization of hemp farming in the 2018 Farm Act just signed into law by President Trump has shined a light on the industry and provided it with a major boost. Since CBDs are far more abundant in hemp products than marijuana-derived CBDs, hemp-derived CBD is the preferred source for CBDs. To be certain, hemp-derived and hemp-infused consumer products represent a market in the hundreds of millions annually that will enjoy outsized growth. However, given the potent effects of CBDs, we believe that the CBD-dominant segment will outshine the traditional hemp consumer products arena. Over 200 companies have a presence in the hemp-derived CBD space. This segment includes beverages, oils, tinctures, vapes, topicals, edibles, etc. The natural products and sports nutrition retail channel is set to drive sales. 75% of users are in the 26-64 age bracket. Consumers procure products to treat anxiety, insomnia, and joint pain/inflammation. 50% say they are more effective than OTC products. 84% of users proclaim they are very or extremely effective. Two-thirds of users prefer 10mg or less CBD per dose. Consumers view these offerings as executing their personal nutrition and fitness needs. “Coke’s possible foray into the marijuana sector comes as beverage makers are trying to add cannabis as a trendy ingredient while their traditional businesses slow. Last month, Corona beer brewer Inc. Announced it will spend $3.8 billion to increase its stake in Canopy Growth Corp., the Canadian marijuana producer with a value that exceeds C$13 billion ($10 billion). Last month, Martha Stewart announced that through a partnership with Canada’s cannabis leader Canopy Growth, she will be launching a broad-based CBD product lie for pets. Today, CBD products are found in beverages, capsules, tinctures, edibles, skin care, etc. and it appears to be one of the fastest-growing consumer product markets in the U.S.
Cryptocurrency mining (which leverages blockchain technology) is the underlying system that allows Bitcoin, Ethereum, and other cryptocurrencies to be traded in a decentralized manner. It revolves around a ledger, or database, that is continuously updated and accessible to the public. Nodes have a copy of the ledger and verify the transactions by completing difficult mathematical problems by utilizing the GPU of the mining rigs. The validators are called “miners”. They authenticate and group transactions into cryptographically protected “blocks” which are then added to the public “chain”. Cryptocurrency miners are slowly rewarded with Bitcoin or Ethereum for carrying out this work, which involves substantial computing power. According to CoinATMRadar.com. there are 4,447 crypto ATMs in the U.S. today, a 62% rise from a year ago. With increasing availability, broad acceptance, and ease of use, this segment is primed for continued growth and utilization. Fees typically range from 5-15% for various buy and other transactions. It is likely to take only 4-6 months following installation before enjoying positive ROI. We categorize risks in two categories: CBD and Crypto, which are considered high risk, high reward segments. For CBD, the Company’s biggest risks are related to the timing and sales momentum of the CBD-infused products, along with being able to differentiate The Greenery products from the competition. An overriding financial benefit is the favorable access to and the availability of capital to fund the product launch, consistent marketing campaigns and other initiatives, if necessary, given the availability of capital for this industry. Competitive risks include lower pricing, more effective sales/marketing, etc. from larger competitors or new entrants. Still, these risks are typical future concerns and are also consistent with firms of GDET’s size and standing. On the crypto side, the industry has left a bad taste for many and it is frequently derided in the press following its huge rise and fall. Still, the Company’s low-cost/high return approach in its fast-growing niche should serve it well. Moreover, the industry is in the early innings of growth, is highly fragmented and GDET could emerge as a leader. It should be noted that in a down market, GDET has managed to only grow/expand their blockchain operation and add new products. The Company shifted from a mining model to a financial/transactional service based business plan. Volatility and liquidity are typical concerns for microcap stocks that trade on the stock market. It is possible that the shares outstanding of this stock could increase due to potential capital needs. However, since the proceeds of any future funding would be used in large part to advance M&As or major business development, we believe that any dilutive effect from such a funding could be offset by related increases in market value. GDET may be the only publicly-traded pure play covering three of the fastest growing, multi-billion-dollar, next-gen industries: Cryptocurrency, Blockchain, and CBD products. Thus, investors can participate in all 3 industries via one investment vehicle, GDET. 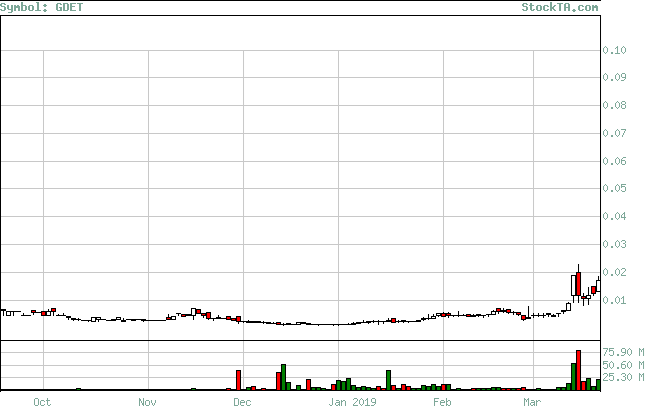 GDET’s new CBD products subsidiary, The Greenery, appears poised to generate meaningful revenue right out of the gate. The Company has been prepping for the receipt of inventory for its initial diversified, product run. Given the upcoming aggressive rollout of its target marketing, we believe that the CBD subsidiary alone could end 2019 on a $2-3M annual revenue run-rate. Rob Goldman founded Goldman Small Cap Research in 2009 and has over 25 years of investment and company research experience as a senior research analyst and as a portfolio and mutual fund manager. During his tenure as a sell side analyst, Rob was a senior member of Piper Jaffray's Technology and Communications teams. Prior to joining Piper, Rob led Josephthal & Co.'s Washington-based Emerging Growth Research Group. In addition to his sell-side experience Rob served as Chief Investment Officer of a boutique investment management firm and Blue and White Investment Management, where he managed Small Cap Growth portfolios and The Blue and White Fund. I, Robert Goldman, hereby certify that the view expressed in this research report or article, accurately reflect my personal views about the subject securities and issuers. I also certify that no part of my compensation was, is, or will be, directly or indirectly, related to the recommendations or views expressed in this research report. Goldman Small Cap Research, (a division of Two Triangle Consulting Group, LLC) produces research via two formats: Goldman Select Research and Goldman Opportunity Research. The Select format reflects the Firm’s internally generated stock ideas along with economic and stock market outlooks. Opportunity Research reports, updates and Microcap Hot Topics articles reflect sponsored (paid) research but can also include non-sponsored micro-cap research ideas that typically carry greater risks than those stocks covered in the Select Research category. It is important to note that while we may track performance separately, we utilize many of the same coverage criteria in determining coverage of all stocks in both research formats. Research reports on profiled stocks in the Opportunity Research format typically have a higher risk profile and may offer greater upside. Goldman Small Cap Research was compensated by a third party in the amount of $3500 for a research subscription service. All information contained in this report was provided by the Company via filings, press releases or its website, or through our own due diligence. Our analysts are responsible only to the public, and are paid in advance to eliminate pecuniary interests, retain editorial control, and ensure independence. Analysts are compensated on a per report basis and not on the basis of his/her recommendations.